Archaeology Laboratory curation and collection projects are open to all Archaeology Technicians. We are currently working on cataloging and cleaning our artifact collections at the BARC, the Visitor Center, Cuyamaca, Palomar and other locations. Come along with us and learn how! Our committee wishes to thank Gary Holmes for his on-going participation in the Boston-Paleo catalog, pictures and all. 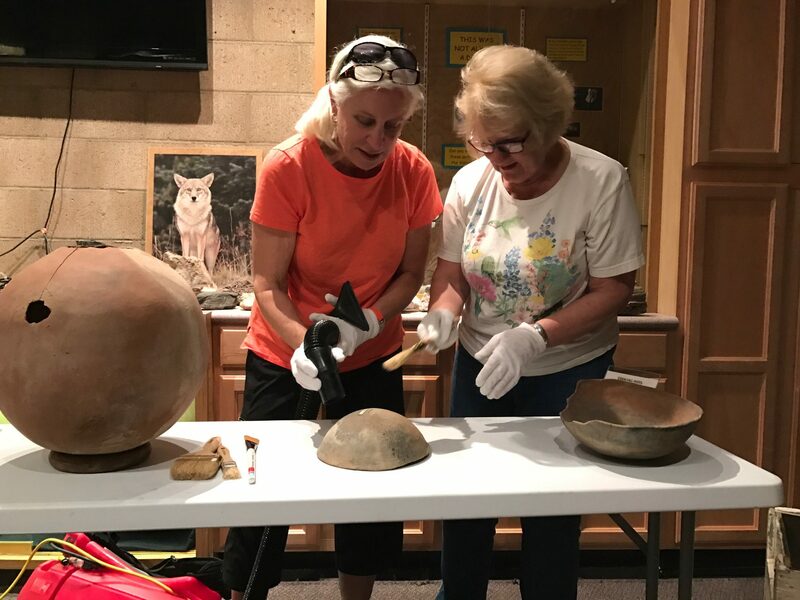 Thanks also to Susan, Julie, Mary Lou and Gary for donning their aprons and gloves to clean and catalog the artifacts kept at the Visitor Center. by brushing the pot and air vacuuming the dust away. Great appreciation to Paula and Rick Huls for their work on the media project.